If you have travertine tile istalled in your home or business, you know that it can get dirty, even if you try to keep it clean by mopping it periodically. Travertine tile cleaning must be done on a deeper level at least once a year for a normal household. The frequency will depend on the amount of traffic in the household. You can either pay to have your travertine tile cleaned by a professional or clean it yourself. Which ever you choose make sure you or the professional knows how to clean travertine properly. As you may already know, your travertine naturally has many holes and depending on the style you have, may or may not have those holes filled in. Some travertine is unfilled, which has the greatest potential to become dirty and will need to be cleaned more often. There are also travertine that is partially filled with grout, still leaving a low area in the tile, where dirt can collect. 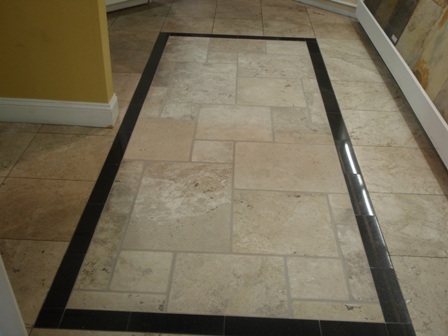 The most easily cleaned travertine are the tiles that have been completely filled with either epoxies or polyesters. 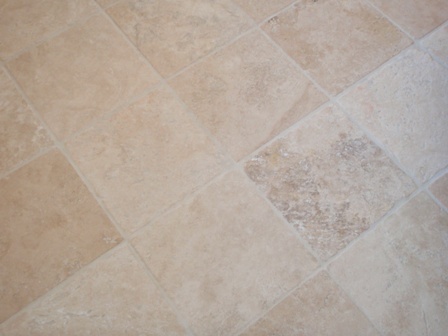 Cleaning travertine on a daily or weekly basis, we recommend using a neutral floor cleaner. For deep cleaning travertine, we recommend a natural stone cleaner that is safe for marble. Part of travertine maintenance is keeping the travertine sealed. Sealing travertine, should be done after installation and after each deep cleaning. If you have a travertine shower, it's especially important to keep it clean and sealed. We always recommend a neutral cleaner for all natural stone surfaces and that includes travertine cleaning. When it comes to travertine tile or any natural stone and tile and grout, we strive to help educate our customers on the best protection they can have, helping them save time and money in costly restoration costs down the road.